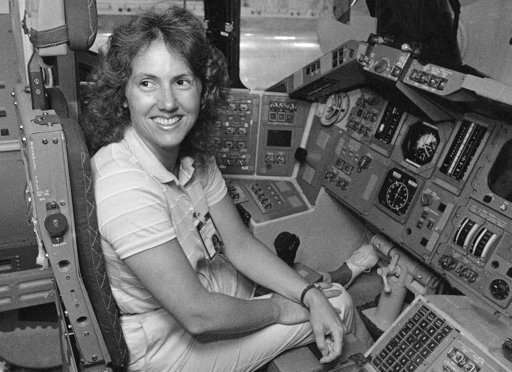 Christa McAuliffe’s lost lessons are finally getting taught in space. In 1985, Christa McAuliffe was preparing to fly aboard the space shuttle Challenger to become the first private citizen in space. She was selected from more than 11,400 applicants for the government’s Teacher in Space program. While in orbit, she planned to film science lessons that would be distributed to classrooms around the country after she returned. McAuliffe was never able to carry out those plans. The 37-year-old social-studies teacher and her six crewmates were killed during liftoff at Cape Canaveral in Florida in 1986. But now, a pair of NASA astronauts are hoping to finish what McAuliffe started. Joe Acaba and Ricky Arnold will carry out some of McAuliffe’s original lesson plans on the International Space Station over the next several months. Acaba announced the news during a video call Friday with students at Framingham State University in Massachusetts, where McAuliffe graduated in 1970. “We look forward to helping to inspire the next generation of explorers and educations,” Acaba said. The astronauts will film four lessons: on effervescence, liquids in zero gravity, a laboratory technique called chromatography, and Newton’s laws, according to the Challenger Center, a nonprofit organization founded by the families of the astronauts who died in the shuttle accident. “Several of the lessons will be completed as originally planned by Christa and a few will be reimagined based on materials available aboard the ISS,” the organization said in a statement. The videos will be posted online in the spring. Acaba is on the International Space Station right now, and Arnold is scheduled to arrive in March. Both astronauts have teaching backgrounds. Acaba taught middle-school math and high-school science in Florida, and Arnold taught science in schools in Maryland, Morocco, Saudi Arabia, Indonesia, and Romania. The Teacher in Space program was created in 1984 under the Reagan administration. “Look no further; I’m the one,” was the most repeated statement in the 15-page applications, according to Realizing Tomorrow: The Path to Private Spaceflight, a 2011 book by Chris Dubbs. Vice President George Bush introduced McAuliffe as the top pick at a ceremony at the White House in July 1985. McAuliffe taught history, law, and economics at Concord High School in New Hampshire. She put her life on hold for months as she trained alongside the NASA astronaut crew and her backup for the mission, Barbara Morgan, an elementary-school teacher from Idaho. After the Challenger disaster, Morgan worked in NASA’s education division and eventually became an astronaut, flying on the space shuttle Endeavour in 2007. Morgan is one of the board members of the Challenger Center. During the final press conference in Houston before the launch, McAuliffe said she planned “to look out the window a lot and experience the wonder of space and bring it back,” according to A Journal for Christa, a biography of the teacher by Grace George Corrigan published in 1993. On January 28, 1986, Challenger broke apart about 73 seconds into its flight, thwarted by a failed seal that was supposed to stop hot gases from leaking out as the shuttle launched. The Space Shuttle program was grounded for more than two years after the disaster, and NASA ended its plans to send private citizens to space, including its Journalist in Space program, which drew in more than 1,700 applications while McAuliffe prepared for her flight. Both programs were developed to gain publicity for NASA, but space-agency officials had hoped that the effort would, in the long run, show young generations that the United States was quickly becoming a spacefaring nation, with routine and frequent transportation to and from Earth’s orbit. In her application to NASA, McAuliffe wrote that she wanted to “humanize the technology of the space age,” according to July 1985 story about her in the Los Angeles Times. “I cannot join the space program and restart my life as an astronaut, but this opportunity to connect my abilities as an educator with my interests in history and space is a unique opportunity to fulfill my early fantasies,” she wrote.